“We are sad to report only two families so far have come forward and adopted cats desperate for homes” states Deborah Titterton Narraway, Interim Executive Director. “We are now running at maximum cat-pacity which tends to happen during kitten season but this year is different – the majority of our cats are adult cats who have been dumped at the Shelter by owners who no longer have a need for them or the ability to care for them. “We pride ourselves on being an open admission shelter, but at this point in time, we are already in an overcrowding situation. A spokesperson said, “The shelter is located on Valley Road in Paget and open for adoptions Tuesday – Saturday 11am – 4pm. Come prepared [bring a cat carrier, photo ID and landlords permission] because there are so many wonderful personalities in the Playroom the staff and volunteers are sure you fall in love with at least one cat. “Foster parents open their homes to care for pets that are either too young, too old or are generally not thriving in the Shelter environment. 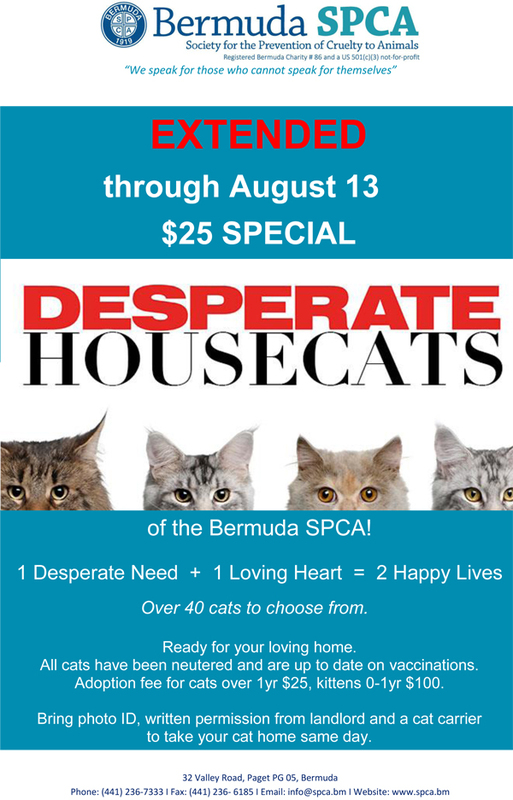 The Bermuda SPCA will assist with home care advice and pay for any special needs expenses such as healthcare, medications or kitten formula. For more information, visit the website, email info@spca.bm, or call 236-7333. I really like what you are doing SPCA…. Giving these lot a chance at a good life is just saintly.